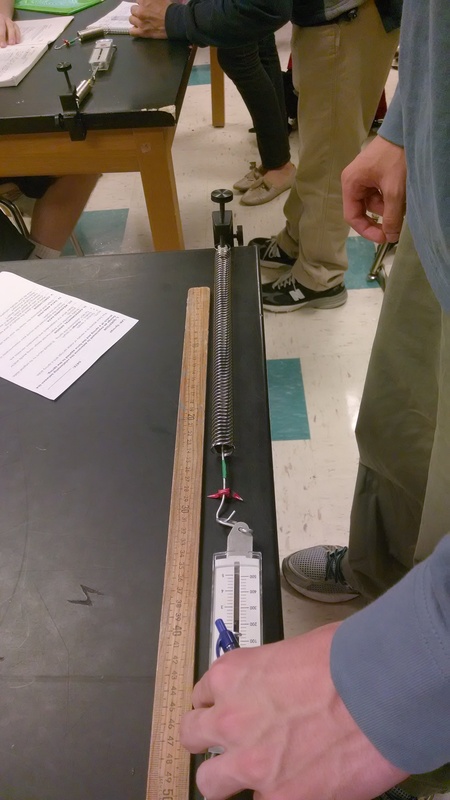 College-Prep Physics: Yesterday, students designed their own experiments to determine the relationship between the stretch of a spring and the force applied to the spring. Today we shared out our results. This year, I chose to use 2 different springs: one with a pre-load (red) and one without (green). My goal is to drive home that not all trends will go through the origin. Some groups still tried to fit a trend through the origin, though. Looking back, if I had been monitoring groups better, I would have asked those groups to go back and take more data for small stretches….hopefully continuing the linear trend down to the y-intercept. AP Physics C: Students are trying to find the pattern for combining spring constants when identical springs are in series and parallel. 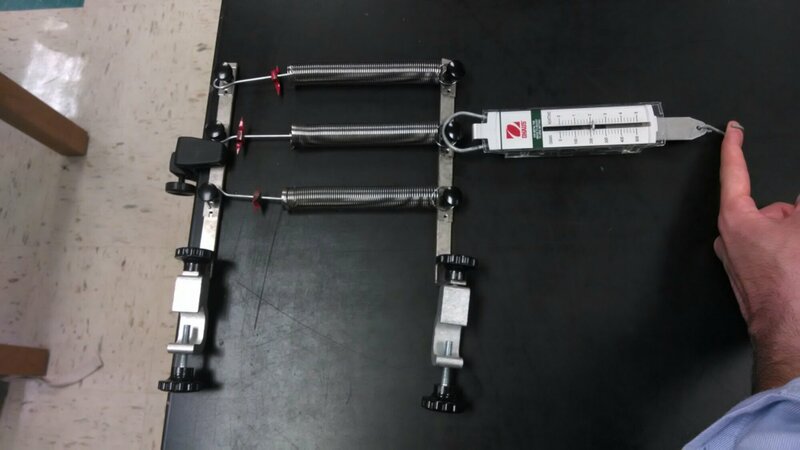 I’m using pendulum clamps as a makeshift way to connect springs in parallel. College-Prep: Today we wrapped up the spring lab. Each group put their graphs on a whiteboard and we compared/contrasted graphs. 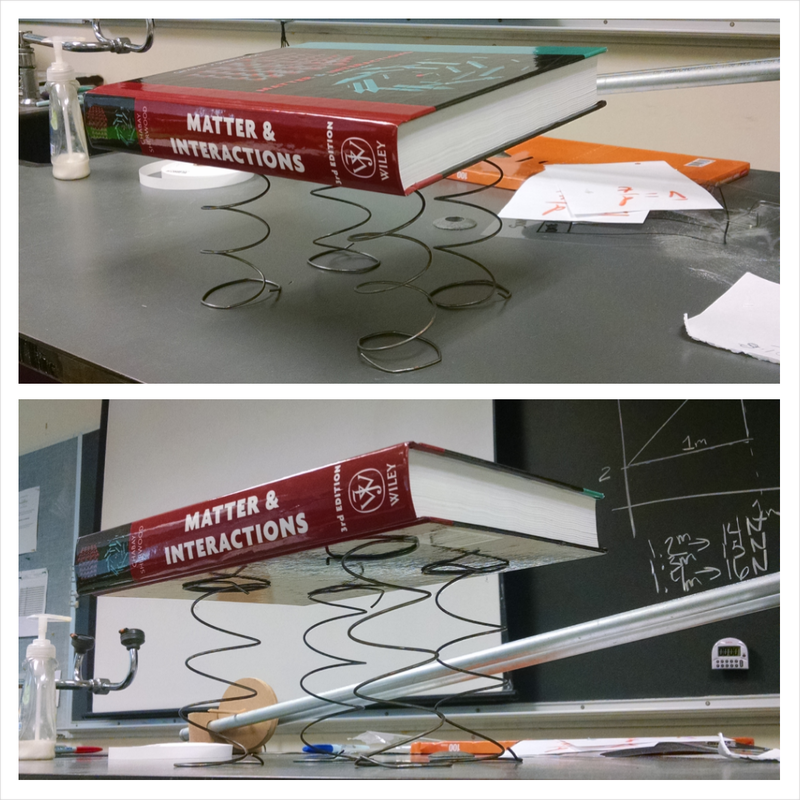 We got at the notion that the slope represented the “Stiffness Factor” of the spring. To illustrate the linear nature of the spring force, we made a Counting Circle. I could see doing this for things like the speed of a tossed projectile every second. Or even the height of the projectile every second (TRICKY!). The Blame Game (a post about why Sadie does Counting Circles). 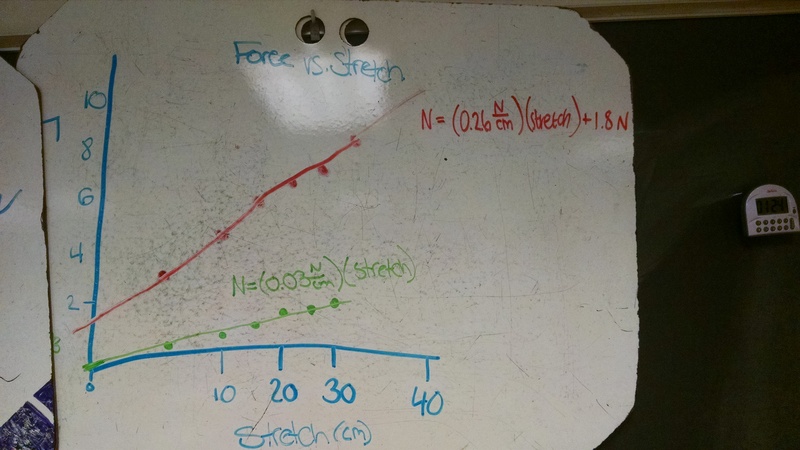 College-Prep Physics: We’ve been discussing the ball-and-spring model for solids, so now it’s time to investigate spring behavior in more detail. What is the relationship between the force applied to a spring and the amount the spring stretches? 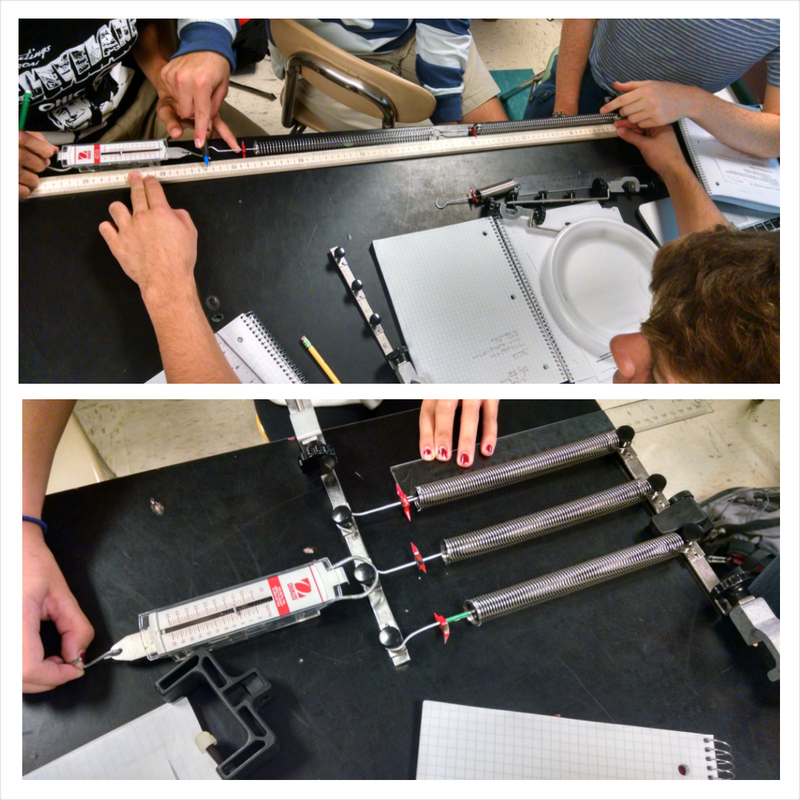 We’re keeping it simple: using spring scales to measure force and making stretch the independent variable. Each lab group takes data for two different springs. Multiple trials for each level of the independent variable. Wide range of values for the levels of the independent variables. Maximum safe stretch = limitation of apparatus, can’t overextend. So if your spring can safely stretch to 50 cm, you maximum level will be 50 cm. Space your lower levels accordingly. Maximum force reading = limitation of instrument, can’t go beyond 5 N. Your spring may safely stretch out to 50 cm, but perhaps doing so means the force is larger than 5 N. So your maximum level will be the stretch at 5 N. Space your lower levels accordingly.